It’s going to be pretty hot in San Francisco over the next few days and we want to remind everyone of some good public health recommendations (brought to us by our friends at the San Francisco Department of Public Health) to keep us cool and comfortable. 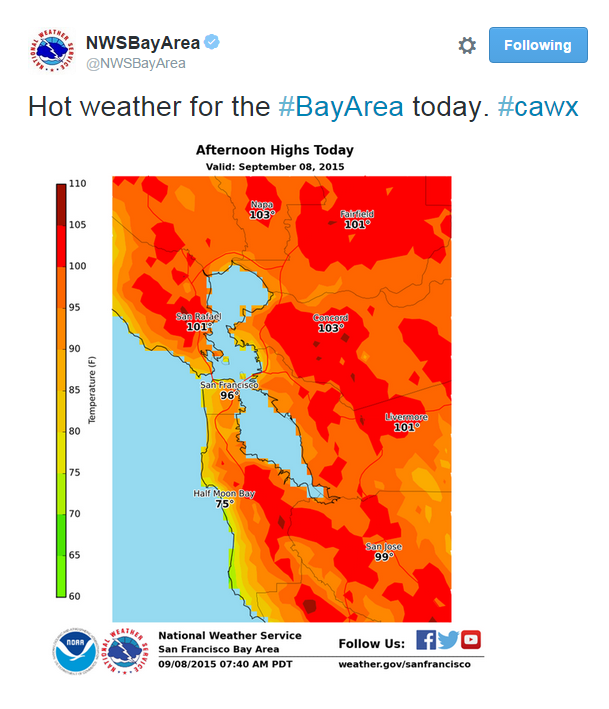 For more information about heat waves and and how to prevent heat illness, check out SFDPH’s Frequently Asked Questions about Heat Waves and Heat Illness. What a summer it’s been in San Francisco, we’ve received more sun than we bargained for! As we look forward to fall we hope you’re ready for the new school year and more lovely warm weather. Check out our seasonal recap and have a great fall! The San Francisco Department of Emergency Management’s 9-1-1 Dispatchers manage more than 1.2 million emergency and non-emergency calls annually and are often the “first” first–responders whom San Franciscans reach when facing an emergency or are in crisis. Every month a DEM Public Safety Dispatcher is recognized for outstanding service while assisting those in crisis. The San Francisco Department of Emergency Management has selected Public Safety Dispatcher Dana Granby for the month of June 2015. Dana is being recognized for her quick thinking and delicacy in handling a cliff rescue call. Dana received a call from a woman whose dog had jumped off of a cliff. She was calling to request help due to the fact that she was now stranded on a cliffside after an unsuccessful attempt to rescue her dog. Both Dana and the caller worked very well together obtaining and providing unusual location information. Dana’s reassuring updates to the caller were instrumental in maintaining the confidence and professional nature in which she handled this at least 20–minute call. The caller did not wonder for any moment during the call what actions were taking place to expedite a safe rescue because Dana’s timely updates covered any questions she may have had. The compassion Dana showed to a dog the caller obviously greatly cared for was much appreciated. Dana’s ability to remain calm and reassuring was a huge part of the success of this cliff rescue. Dana, you are an asset to the Department of Emergency Management. San Francisco Department of Emergency Management has selected Public Safety Dispatcher Janelle Meyer for the month of July 2015. Janelle has been selected for her exemplary performance during a heightened call regarding a newborn who wasn’t breathing. Janelle received a frantic call from a woman reporting that a newborn was not breathing in her home. Janelle immediately obtained all pertinent response details and attempted to give CPR instructions. Although the phone was passed around many times, increasing the panic and emotion felt from the callers, Janelle did not give up on her attempt to relay CPR instructions to whoever would listen. Her ability to remain calm, poised, and professional during such a highly charged call is nothing short than exemplary. Janelle received many encouraging emails, hugs, and words speaking to what a great job she did from her colleagues and peers. Janelle, we thank you for being such a strong team member here at the San Francisco Department of Emergency Management. The San Francisco Department of Emergency Management has selected Public Safety Dispatcher Dawn Mahoney for the month of August 2015. Dawn has been selected for her spectacular performance during a call received from a boy reporting a person who had fallen and was unconscious. Dawn received a call from a young boy reporting a person had fallen and was not awake. The child was unsure of the address and there happened to be a slight language barrier. Her ability to utilize a variety of call taking techniques to obtain and verify the correct information was instrumental in this call’s success. Dawn was able to convey CPR instructions that the caller was able to understand and follow. Dawn’s calm and reassuring demeanor were just what the young caller needed to hear. It is often that our dispatchers receive difficult calls, always having to think fast and improvise on their feet. Dawn, we are grateful for your versatility and fast response. 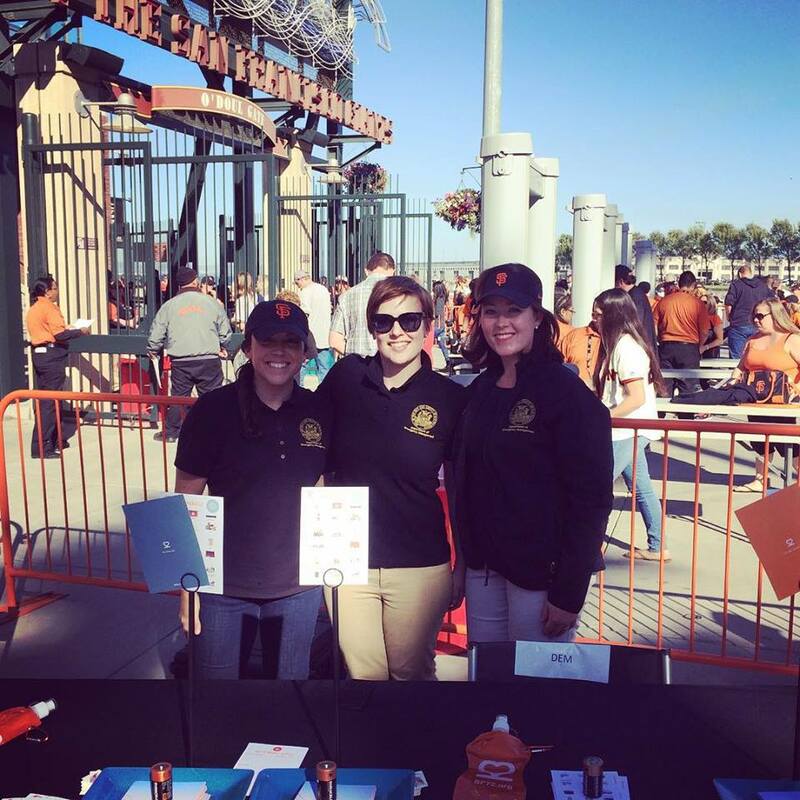 Stationed in McCovey Cove on a beautiful day, we were happy to participate again in this year’s “Giant’s Public Safety Fair.” We were joined by several other public safety organizations such as the FBI and the Sheriff’s Dept. 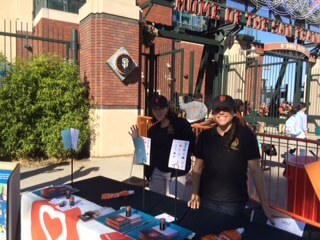 to share our message and teach Giant’s fans all about safety and preparedness. 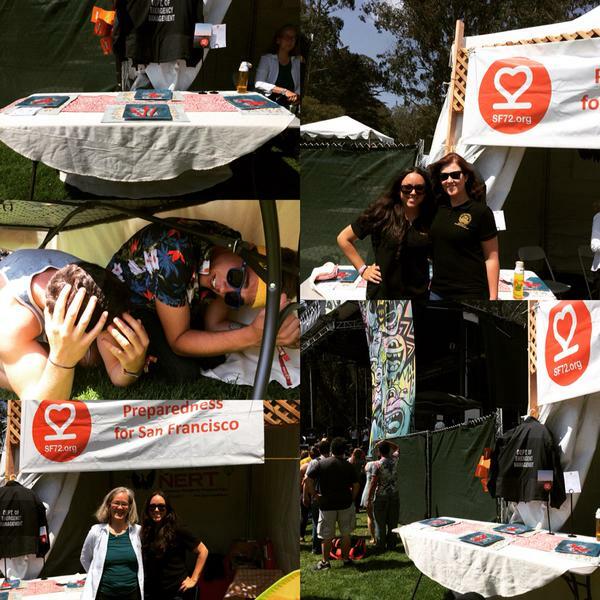 This was SF72’s first year participating in Outside Lands Music Festival’s Eco-Lands, Non-Profit Partners Exhibition and we were joined by our partners the San Francisco Fire Department’s Neighborhood Emergency Response Team. We were surrounded by booths of do-gooders who came out to share their message with a swelling daily audience of 65,000 concert-goers per day. Our goal was to reach as many people as possible with our preparedness materials and messages. One fun way that we decided to engage the crowd was to ask curious individuals and groups what they did if an earthquake hit. After sharing that the only way to respond was to: “Drop, Cover, and Hold On!” we asked them to show us what they learned with a mock dining room table. 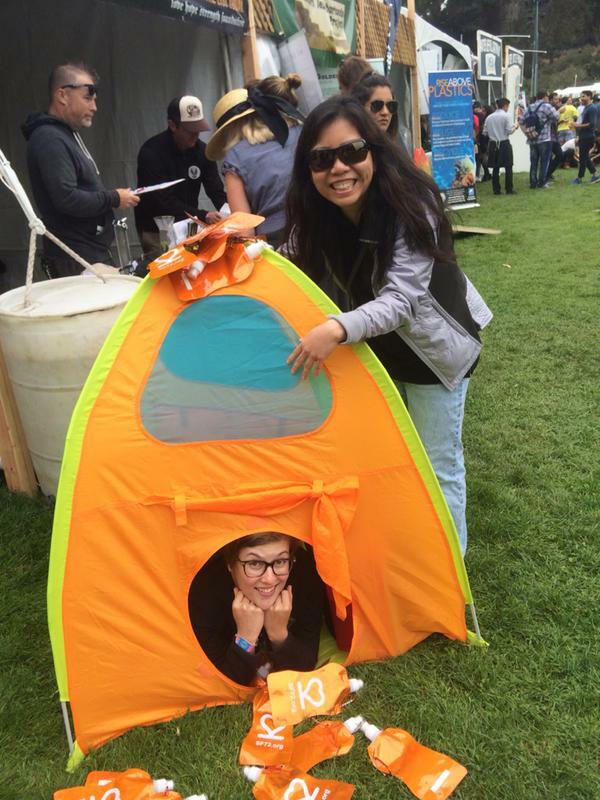 Our exhibitions led to laughs and lessons learned and we had a great time showing force at this year’s OSL. If you’re prepared to camp, than you’re more prepared for an emergency than you think! Another successful event supporting our partners and engaging with the community at this year’s National Night Out! National Night Out is a community-based event that invites neighbors across the nation to participate in safety education. 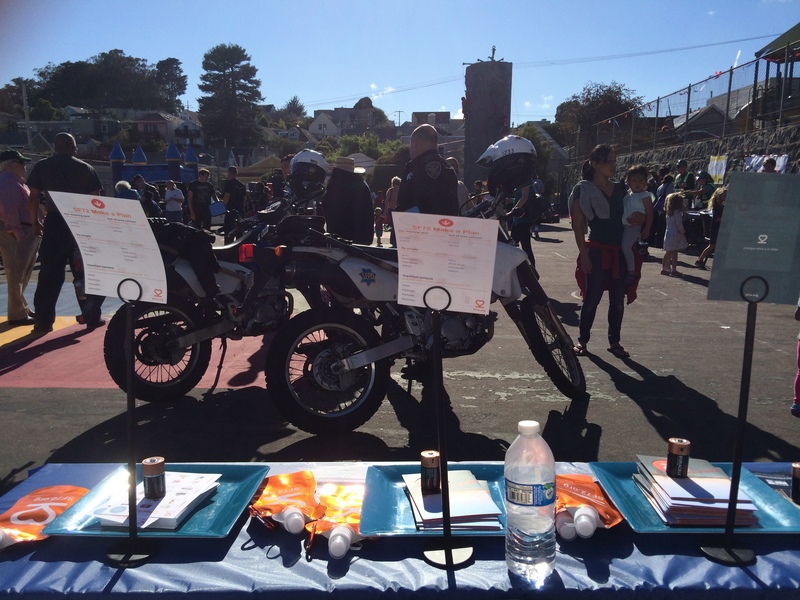 We joined forces with the San Francisco Fire Department’s Neighborhood Emergency Response Team, the San Francisco Fire Department, SF Safe, the San Francisco Police Department, the District Attorney’s Office, and many others to increase awareness on local safety issues. After attending an amazing training hosted in partnership with NERT and SFCARD’s own Susan Schmitz to train trainers on psychological first aid, our community partners were refocused on this vital skill that people from all backgrounds could greatly benefit from. Susan Schmitz answered some of our questions regarding pyschological first aid and her background. Can you tell us what Psychological First Aid is? During a disaster, the psychological issues resulting from trauma and distress can be just as alarming as physical injuries. In addition, the effects may not be seen immediately and may become long lasting. The National Child Traumatic Stress Network and the US Department of Veterans Affairs, National Center for PTSD created a nationally recognized Psychological First Aid (PFA) model to offer an immediate intervention and attempt to minimize the long-term mental health impacts. Similar to medical first aid, PFA is a process for addressing immediate mental health needs. This evidenced informed approach teaches tools and techniques that can be applied by anyone to anyone after a disaster. It is intended to be used by all responders (professional and volunteer) and is the leading psychological intervention used by people without a clinical background. Where did you get the idea for doing psychological first aid training with NERT trainers? I spent two years teaching SAFETY FUNCTION ACTION to first responders and public health employees throughout the state of Florida. This is a disaster behavioral health model developed by Dr. James Shultz, and, similar to PFA, is clinically informed and intended for everyone. Everywhere we went, the audience was eager to learn what to say to the survivors they would be working with following a disaster. It showed me that there are more disaster behavioral health options available than just PFA, and what it really impressed upon me, was that all first responders need this training. Therefore, it’s something about which I have continued to be passionate. Luckily, while working at SF CARD, I had the opportunity to talk about this interest with Teri Dowling (SF DPH) and Erica Arteseros (SFFD – NERT). They too had wanted a mental health training for volunteer responders, and had been trying to find a way to get it. Together we decided to make this become a reality. SF DPH graciously funded SF CARD to create a PFA presentation and train the trainer training specifically tailored to NERT’s needs. Simultaneously, Dr. Elizabeth McMahon, private consultant and psychologist, was asked by a NERT volunteer to teach a disaster mental health training. This just emphasized that we were on the right track. Volunteers wanted this type of training! So, together Dr. McMahon and I set out to create a tailored NERT PFA model. Our final team included myself, Dr. McMahon, Erica Arteseros (SFFD NERT), Shea Baldez (SF CARD), and Teri Dowling (SF DPH). What we found while trying to apply national PFA Core Actions to NERT was that traditional PFA tools often focus on shelter or disaster service workers. This does not accurately apply to the experiences NERT volunteers (or first responders) will have during a disaster. Also, we received focus group feedback asking us to tailor our program even more to the needs of NERT volunteers. For example, include how to provide PFA during triage and focus on what volunteers could realistically do for survivors within their NERT roles. Ultimately, we created a PFA training that complements and adds to current PFA/disaster mental health best practices. What do students learn in this training? Teach, model, and allow practice of culturally competent skills that can quickly and effectively be learned and applied. Increase volunteer confidence and effectiveness in handling distressed teammates and community members. Reduce risk of Post Traumatic Stress Disorder symptoms in volunteer responders and community members. Can you tell us where you got your passion for this topic? I think my passion for disaster mental health stems a lot from personal experience. My family has survived two tornados and I’ve seen not only physical destruction, but also psychological resilience. Neighbors, family, friends, all come together to offer support. Usually people offer to help in tangible ways (cleaning, cooking, childcare), but what they’re also doing is helping survivors emotionally. Social support is something so powerful when dealing with a traumatic event and it’s something we often forget and overlook. Psychological First Aid, while providing tools and techniques is also, at its very basic level, reminding us how to be kind to others when they most need it. You don’t need to be a clinical psychologist to offer that kind of support, you just need a reminder of how this may look when times are stressful. What has the demand been like for this training? Are people interested? Do you think youth might be interested? Demand is skyrocketing. We provided one NERT PFA Train the Trainer Training in SF and the class was full. SFFD is already looking for more funding so we can hold another one soon. The Human Services Agency, SFPD, SF DEM, and multiple nonprofit and faith based organizations are asking for more information on what PFA would look like in their agencies. SF CARD has provided a PFA training for residential care facilities staff (which is different from the NERT PFA model) and has added this to our roster of available trainings. In addition, Dr. McMahon and I provided a brief overview of what we have created at the Northern California CERT conference and found overwhelming interest. CERT teams from around the state are interested in bringing this to their teams and would like to see this model become incorporated with the National CERT training. Want to learn more about NERT? Check them out online for free trainings in emergency preparedness.